He arrived back in China on Thursday, May 26th after staying in Houston the past 3 weeks, and brought his wife Ye Li and baby daughter Amy Yao Qinlei. Because it is the first time that Amy Yao has ever been in China, a large number of reporters gathered at the VIP entrance of the Shanghai Pudong International Airport (as well as Yao Ming’s home), trying to get a glimpse of the family. However, they were unsuccessful since Yao and family left through a different airport exit, and didn’t return to their old home in the Xuhui District but to a new home somewhere else. 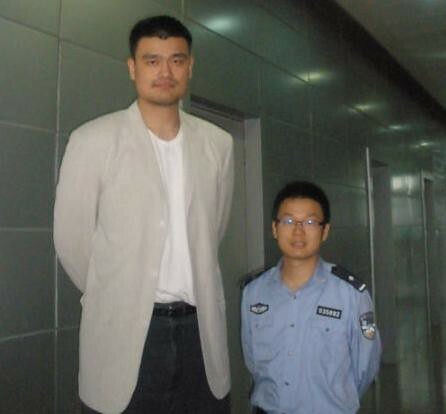 But there was at least one photo taken of Yao at the airport with an immigrations official. According to sources at the airport, daughter Amy Yao uses a U.S. passport, and is a little bit taller than most one year old babies her age (no surprise there). Given the looming NBA lockout for next season, and the fact that he will be a free agent this summer with his future in NBA still pending, it seems that Yao is going to stay in China at least through the summer according to his representative Erik Zhang Mingii. Organize a birthday party in Shanghai for his daughter, who just celebrated her first birthday in Houston on May 21st. Meetings with Team Yao about the team he owns, the Shanghai MAXXIS Sharks. Continue to work out details of the 3rd Yao Ming Foundation Charity Game/Gala, which will be held in Shanghai in August. An inauguration ceremony in Ganxu in June for another Yao Foundation Project Hope primary school. Continued rehabilitation on his ankle. This entry was posted on Friday, May 27th, 2011 at 6:46 am	and is filed under China, Rockets' off-season. You can follow any responses to this entry through the RSS 2.0 feed.